When you travel to North Carolina’s northern coast, you’ll find more than just gorgeous beaches. Yes, you could spend day after day lounging on the beach. And, really, who would blame you? But those interested in exploring the area will find the region has plenty to offer culture vultures and adventure seekers alike. Sample regional wines or get a taste for the local art scene. Or take to the waters to discover the vibrant ecosystems of the coast and estuaries. Named after a grape unique to the southern U.S., the Scuppernong River provides the perfect backdrop to the Vineyards on the Scuppernong. The vineyards began as a family business when the owners purchased the 300-acre farm. The couple originally planned to develop the land into a neighborhood, but they soon realized how attached they had become to the farm. They decided to keep the land, and soon after, Vineyard on the Scuppernong was born. Stop in for an onsite tour and sample wines in the tasting room. Or, opt for the full experience with a river tour. Available to small groups on Thursday mornings, the river tours take visitors by boat to the vineyards. The owners happily greet guests at the dock. You’ll be invited to explore the vineyards and see how the grapes are grown before heading to the winery for a tour and tasting. Space on these tours is limited, so visit the website for information about how to reserve a spot. If you prefer not to drive yourself, arrange for a ride along with a guide into the heart of the 4 wheel drive area north of Corolla in one of Kitty Hawk Kite’s unique, custom vehicles. The breathtaking scenery and ocean breezes, with eclectic history and folklore added to the mix, will create lasting memories for all. You’ll have a ball. This tour of Corolla is 2 hours long and about 20 miles round trip. You will be guided and driven in a custom 10 passenger four wheel drive vehicle. Your guide will take you into the Wild Horse Conservation Easement and other areas accessible only by us. Delve into the arts and culture of Eastern North Carolina at the Arts of the Albemarle. Here you’ll find a variety of visual and performing arts all housed in the restored Lowry-Chesson building. The historic Maguire Theatre was installed in the original Lowry-Chesson building and has remained virtually the same since it was built. The 250-seat performance venue hosts a variety of performances, ranging from local and regional acts to nationally know artists. The theater also hosts regional theatrical troupes and dance performances. Children who attend classes in music, dance and drama at the School of the Arts perform in the theater, as well. Check out the website for a list of upcoming performances. At the Jacqueline Jenkins Gallery and The 516 Gallery, you’ll find an ever-changing collection of art exhibits, which include works by local, regional and national artists, craftsmen and photographers. In addition to the rotating exhibits, the galleries collectively house over 250 works of art in a variety of mediums by artists from around the world. Visit the North Carolina Estuarium, the only museum of its kind. Dedicated to educating people about the unique coastal ecosystems where rivers meet the sea, the museum is a fun and exciting place to spend an afternoon. A knowledgeable staff is on hand to answer questions and add to your estuarium experience. Over 200 exhibits help to bring the ecosystems to life. Get an up close look at crabs, alligators and other wildlife that inhabit the area. Then set out to explore the area and put your newfound knowledge to use. Join in the estuarium’s River Rover boat trip. You’ll boat along the Pamlico-Tar River and experience firsthand what life is like in the estuary. Your tour guide and boat captain will be on hand to answer questions and point out wildlife along the way. Come face-to-face with regional wildlife on a canoe journey through the wetlands of Albemarle along the Albemarle Regional Paddle Trails. With plenty of paddle trails to choose from anddownloadable trail maps online, the opportunities for adventure are endless. A complete guide to the trails offers a brief summary of the animals and plants you’ll encounter along the way. Also listed, are the approximate lengths of time for each trail and the difficulty level, so you can pick a route that suits your needs. Wind your way among the rivers, swamps and canals of the region along these marked trails. You’ll pass through sunny patches where the sun peeks through the leaves overhead and under thick shady canopies. Hear birds calling, and perhaps, catch a glimpse of a beaver building a dam. Wherever you paddle, you’re sure to find off-the beaten-path adventures. Extend your journey by packing a tent and sleeping bag for a night spent among the trees. The area offers 22 raised camping platforms that make it easy to camp right next to your paddle trail without fearing soggy ground. Request more information about these and other activities available along North Carolina’s northern coast, or for specific questions, contact the local visitor’s bureaus: Dismal Swamp Canal Welcome Center in Camden County, Outer Banks Visitors Bureau, Elizabeth City CVB, North Carolina’s Northeast Commission, Chowan County TDA. The Penelope Barker House Welcome Center is a waterfront historic house offering information and maps, trolley tours of historic sites, exhibits, restrooms and a book and gift shop. Known as Edenton’s Living Room and a nice place to relax and enjoy the views of Edenton Bay. 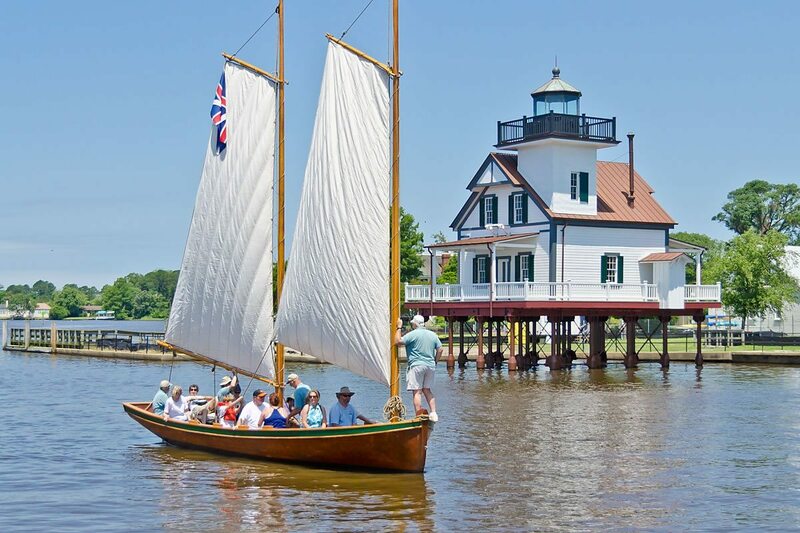 Then head down to the 1886 Roanoke River Lighthouse. The lighthouse is believed to be the last extant example in the United States of a squarer frame building built for screw-pile base. The lighthouse was in commission from 1887 until 1941. Dine in the Historic District at The Table at Inner Banks Inn. The Table is ranked among the top 25 of over 2800+ North Carolina Coast restaurants. Guests enjoy the romance and exceptional dining experience while the chefs tantalize guests with inspired farm to table menu. Learn about the history of your favorite coastal vacation destination. The Roanoke Adventure Museum the perfect activity for days when you’ve had a bit too much sun or just want to explore something other than the beach. Exhibits in the museum take visitors on a journey through the history of Roanoke Island and the surrounding area. Discover 16th century navigation techniques and “meet” the explorers who employed these techniques in order to reach Roanoke. Children will enjoy taking an interactive approach by donning traditional 16th century garb that would have been worn by settlers. Hear tales of the pirates who raided the shores of North Carolina and plundered ships sailing out of North Carolina ports. A map of local shipwrecks will help to bring stories of Blackbeard and the like to life. Then return to the present with exhibits about the hunting, fishing, boating and tourism industries that have shaped the modern-day Outer Banks. But who says you have to wait for a rainy day to visit a museum? Situated in Roanoke Island Festival Park, the museum itself is just one of the many activities that teaches visitors about the “lost colony” on Roanoke Island. For outdoor fun, explore the American Indian Town, chat with settlers at the English Settlement Site or climb aboard the Elizabeth II, a replica of a 16-century ship. Spot a variety of marine wildlife, including pelicans, sea gulls, schools of fish and dolphins, as you sail aboard the Schooner Jeanie B. Modeled after the 17th- and 18th-century ships that once ruled the waters of coastal North Carolina, the Jeanie B patrols upper Pamlico River from Washington to Bath. The sky dons brilliant hues of red, orange and pink over a horizon of sea and marsh grasses during a sunset cruise. All you have to do is sit back, relax and enjoy the view. Or, for a more interactive experience, embark on a half-day excursion. Lend the crew a hand by helping to trim the sails or even steer the ship. True adventure seekers can take to the open water on a multi-day voyage. No coastal vacation is complete without a traditional cookout, and perhaps a few refreshing beers, too! Visit the Weeping Radish Brewery, Butchery and Pub to stock up on locally made cookout essentials for your ultimate barbecue. The oldest microbrewery in North Carolina, Weeping Radish has quite a legacy. Founder Uli Bennewitz, who was raised in a small German village, dreamed of bringing high-quality German brews to his new home in North Carolina. But in the late 1980s, state laws banned microbreweries from selling beer to the public. That obstacle didn’t stop Bennewitz, however. He worked with his local senator to change the law, and soon after, Weeping Radish Brewery was born. And of course, no pint of German beer would be complete without traditional brats on the side. That’s why the brewery also has an in-house German Master Butcher. Only sustainably-raised, locally-sourced meats are used to create brats, bacon, kielbasa sausages, Andouille sausages and more, which are all served in the pub and sold separately onsite. Stop in anytime for a free, self-guided tour of the brewery, or visit at 11 a.m. on Wednesdays for a guided tour and tasting. Request more information about these and other activities available along North Carolina’s northern coast, or for specific questions, contact the local visitor’s bureaus: Dismal Swamp Canal Welcome Center in Camden County, and Elizabeth City CVB.